Dr Alexander Comninos joined Imperial College School of Medicine on Academic and Music Scholarships in 1997. He completed an intercalated BSc in Endocrinology in 2001, for which he was awarded first class honours. On completion of his medical degree, he trained in Endocrinology & Diabetes and General Internal Medicine in several London hospitals and was awarded an NIHR Academic Clinical Fellowship to continue his research alongside his training. 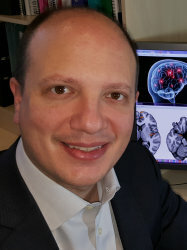 Dr Comninos has authored over 35 clinical and translational original research publications in Endocrinology and has presented his work in talks internationally, including at the British Endocrine Society, International Congress of Endocrinology, American Endocrine Society and European Society of Human Reproduction and Embryology Annual Conferences. He has won several international awards including three Outstanding Abstract Awards and the Best Oral Presentation in Reproductive Science from the American Endocrine Society as well as the Clinical Endocrinology Trust Prize from the UK Society for Endocrinology. Dr Comninos is heavily involved in clinical work as a Consultant Endocrinologist at Imperial College Healthcare NHS Trust (based at St. Mary's, Hammersmith and Charing Cross Hospitals). Alongside general endocrinology, his special interests include reproductive hormones and calcium disorders including osteoporosis and hyperparathyroidism. In addition, he continues in research and education as an Honorary Clinical Senior Lecturer at Imperial College London. His clinical and academic contributions were recently recognised by the UK Society for Endocrinology with the award of the prestigious Early Career Clinical Prize, presented to the leading Early Career Clinical Endocrinologist in the UK. He continues to publish research in notable journals including The Journal of Clinical Endocrinology & Metabolism, The Journal of Clinical Investigation and The Lancet alongside his clinical Consultant Endocrine practice.